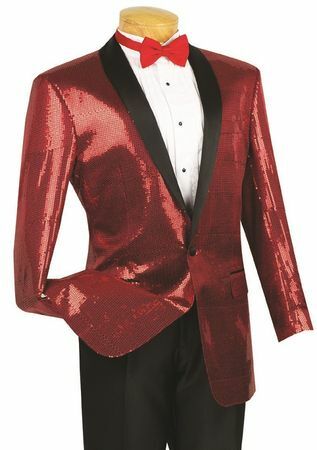 You'll be ready for Vegas in this mens red sequin tuxedo suit jacket. Do you put on clothes in the evening or do you get dressed with a purpose. If your answer is the latter, than you're a good candidate for adding this shiny entertainer style red sequin tuxedo suit jacket for your purposeful wardrobe. This red sequin tuxedo suit jacket has a tuxedo jacket style that will set you apart. Featuring a classy shiny red sequin fabric tailored into a modern fit 1 button style. This fine stage inspired red sequin dinner jacket will be a quick favorite of yours once you take a glance in the mirror.